CHARLOTTE, N.C. – On the first day of the Democratic National Convention here Tuesday, every speaker who took the podium, every surrogate doing television interviews, seemed to be on message, celebrating President Obama’s accomplishments and drawing stark contrasts with Republican Mitt Romney. But Denver Mayor Michael Hancock, in an interview with FOX31 Denver, went off the script, openly criticizing the Obama campaign for its sustained effort to pressure Romney to release his tax returns. It was a Cory Booker turn for Hancock, who also named Booker first when FOX31 asked him which other U.S. mayors he identifies with the most (Hancock had just attended a U.S. Conference of Mayors luncheon prior to the interview). Booker spoke at the DNC on Tuesday night and electrified the Democratic crowd. The Newark, N.J. mayor likely would have gotten a better speaking slot had he not criticized the Obama campaign earlier this summer for attacking Romney’s record as CEO of Bain Capital — a criticism echoed by former President Bill Clinton, who, incidentally, speaks in primetime Wednesday night. Hancock is not a delegate, nor was he given a speaking slot at the DNC. He traveled to Charlotte to attend meetings and to promote Denver, which will play host to the first presidential debate on October 3. “I think it’s my role as a Democrat, as a mayor who supports the president, to say to the president and his people, ‘Listen, it’s not about Romney; it’s about the American people’. Michael Bennet's win in 2010 may offer a false hope for Obama in Colorado. Bennet won by about 30,000 votes, making him the weakest winner in a Colorado US Senate race in the past decade. Obama's forces tout Bennet's focus on women's issues as a model for winning in 2012, and, indeed, a narrow slice of women won it for Bennet. Obama TV ads parrot this narrow focus. Yet Bennet's weakness came from a substantial drop in Hispanic levels of voting – a mandatory part of Obama's coalition. Here's what happened in Colorado's last two elections. 195,000 Colorado Hispanics voted in '08, but only 144,000 did in 2010 (US Census). Since 2010, 10,000 Hispanic voters dropped from the voter lists. It's hard to maintain Hispanic excitement about voting. Federico Peña registered more than 5,000 new voters in minority neighborhoods of Denver his first race. They provided his winning margin. Peña had been a MALDEF lawyer, but, as mayor, he played down that liberal, activist Chicano de Aztlán background. His reelection battle – with a Republican opponent in heavily Democratic Denver – produced a very narrow 3,000 vote margin. Peña had lost some magic. On a teeter totter, Obama's economic failures have really harmed Hispanic families in Colorado, but Obama's policy change on deportation helped him. For those with ties to Mexico, immigration helps. Among Hispanics whose parents were born in the US, however, just 7% rate immigration as their most important issue – while economy/jobs earn 36% as top issues. That issue focus differential may explain why Romney already has McCain's Hispanic share. Just 52% of Hispanics are enthusiastic about voting now; 64% were in 2008's summer. Despite more Hispanic citizens in Colorado, a drop in voting to match the lower enthusiasm could mean fewer Hispanic voters in 2012 than four years ago. Pundit Charlie Cook sees a Hispanic enthusiasm deficit in August's polling. Matt Barreto of Latino Decisions polling firm has a different view. He estimates one of eight registered Colorado voters will be Hispanic. If Barreto is correct about turnout, that would give Obama a real boost. Colorado would swing about 1.25% to Romney if, instead, 2012 replicates US Census Colorado's 2008 ethnic turnout numbers. In oh-so-close Colorado, that is significant. I am not rooting for low Hispanic turnout. The stakes in 2012 are so high that election results should include the views of every citizen eligible to vote. Paul Ryan was chosen and yips and yells were heard on the right and on the left. ?The Democrats and their pundits had a plan. ?They ripped into the Ryan Budget as the end of Medicare. ?The Romney campaign was quick to point out that the only one to affect Medicare is Obama’s $716 billion dollar theft to pay for Obamacare. ?The response from the Democrats is the hook they want all to swallow: The Ryan Budget included the $716 billion dollar Medicare theft to pay for Obamacare. The Romney campaign stumbled in explaining that Romney’s budget doesn’t include that provision. ?They fell into the trap the Democrats and pundits were hoping for. ?The DNC’s talking points are that Romney is distancing himself or worse divorcing himself from Ryan’s budget. ?The Romney campaign tried to defend that Mitt is at the top of the ticket. ?Cracks seemed to appear overnight between the dynamic duo. ?I’ve even heard some on the right worry that Romney is flipping on Ryan’s budget. An effective budget must be based on real numbers, not imaginary or hopeful numbers. ?A head of household that hopes to get a new or better job in six months can not budget for that income until that income is realized. ?Ryan’s budget had to?accommodate?existing laws, not future repeals of laws and sadly Obamacare is law. ?Ryan’s budget had to reflect the reality of ?Obamacare’s effect on Medicare. The Democrats want to wrap the old static budget of real numbers around Romney’s neck and not allow any movement for what a campaign must do: explain the vision for the future. ?The Romney campaign needs to get Ryan out in front and have him explain in simple terms the difference of a budget which is a snapshot of existing laws verses the vision that both Romney and Ryan will lead us to. ?A budget without Obamacare. It’s time to throw the hook back at those that cast it out. ?They fail to?understand or even have a budget. ?Romney and Ryan are not moving away from the values in Ryan’s Budget they are showing us the new plan for the next budget. ?A budget without Obamacare. It’s time to get Ryan to put that in simple to understand terms. Visitors to downtown Colorado Springs are besieged by panhandlers, according to city officials. So they drafted an anti-solicitation law that prohibits begging in a designated area. Quicker than you can say “Got a quarter?,” the American Civil Liberties Union issued a warning that the proposal may violate the First Amendment. “I would advise them not to pass this severely flawed ordinance,” said Mark Silverstein, legal director of the ACLU of Colorado, according to the Colorado Springs Gazette. Unspoken is the threat of an ACLU lawsuit, an uncannily accurate indicator that the city is on to something good. City officials don’t seem worried by the ACLU’s reaction, and they note that the proposed law is based on a Fort Lauderdale anti-begging statute upheld years ago by federal courts. Colorado Springs’ proposed statute will get a first reading and public hearing on Sept. 11. “What the downtown ‘no solicitation zone’ is seeking to do is not to prohibit content of speech but to prohibit conduct, which is to approach a person to solicit,” said Colorado Springs City Attorney Chris Melcher. Although the city appears to be on solid legal ground, Mr. Melcher said officials will meet with ACLU representatives to iron out a compromise, if possible. If the ACLU begs to differ too much (sorry), the city will go ahead anyway with its plan, he said. Also, city officials may expand the no-begging zone to take in a park, which may complicate things because parks have long been considered free speech zones. Try walking across a park in Washington, D.C., for instance, without being accosted by a panhandler or a political, uh, enthusiast. One might think that Colorado Springs, also a tourist destination, would have a similar interest in encouraging downtown foot traffic, even if it’s not near a beach and is instead in the shadow of Pike’s Peak (14,115 feet). For that matter, so would Washington, D.C., which attracts an estimated 25 million visitors annually to the national mall area and nearby monuments, and has an army of homeless people year round. The challenge for a free but compassionate society is to balance the need for a safe, crime-free environment for all against the truly tragic circumstances of many of the down and out and their freedom to depend on the kindness of strangers. Colorado Springs, like Fort Lauderdale and other magnets for transient populations, has a network of shelters and services for the homeless, and appears to be trying to thread that needle despite the ACLU’s implied threat. Robert Knight is senior fellow for the American Civil Rights Union, founded in 1998 to counter the ACLU’s assault on traditional American values. “This is an independent study course that would be available to any student in any campaign,” said Julie Waechter, a spokesperson for ASU, in an interview with TheDC News Foundation. Waechter declined to give the name of the employee who authorized the course. Dodie Day, the administrator who posted the blog entry, declined to comment. According to Waechter, the Obama administration reached out to the university about hosting such an offer. “The Obama campaign did approach the school. Others campaigns did not,” she said, adding that the school would have considered a similar offer from the Republican campaign of Gov. Mitt Romney. But Peter Wood, president of the National Association of Scholars and a chronicler of political bias in academia, said universities have no business awarding class credit for political activity at all. Earlier this week, Wood reported on a similar instance of liberal political activity entering the classroom at Ohio State University. Professor Brian McHale wrote an e-mail to colleagues asking them to set aside class time for campaign organizers to pitch students on getting involved with the Obama campaign. “I’ve been in touch with a couple of campus organizers for the Obama campaign, who have asked me to pass along to all of you a request for access to your classes in the next few weeks,” wrote McHale in the e-mail. For Wood, incidents like the ones at ASU and OSU fit an extensive pattern of improper cooperation between the Obama campaign and university officials. “It’s one of those things I add to the documentation of fairly numerous instances in which the Obama campaign has crossed the line,” he said. Stephanie Freer, a recent graduate of Northern Arizona University and conservative activist in Colorado, was disturbed that ASU would advertise a class that promoted a liberal political agenda. Jim, with Tampa behind us, let me add emotion to your metrics. You draw the conclusions. Keating's polls encapsulate the problem. No Obama movement here in 90 days. Still below the critical 50% threshold. At 51% among women, we're 5 points below goal with them. Contact reports are in the same range. Compared to past Colorado August polls, we match Obama's 2008 and Bennet's 2010 numbers. On the ground, it's different. In 2012 Republicans are holding their own. From January to August in '08, by contrast, we out-registered Republicans 5 to 1. This difference creates a problem. Here's why. Jim, last year you laid out the registration goal for Colorado. 2010 had cost us registration-wise. We dropped 180,000, Republicans 100,000. Since January, we advanced 29,000; GOP numbers are up 26,000. Their initial advantage in actives means the January gap (113,000) isn't closing. We are pounding Republicans in contact numbers, but not earning results to match 2008. Greatly lower enthusiasm and voters who've vanished in the economic turmoil. And there are few Colorado Democrats we didn't find before 1/1/12. “Why bother?” potential registrants ask. This denies us the ammunition of victory: votes. We won't close the gap, unlike the 65,000 surge of fall 2008 (field director reports). There is no new majority for us. Instead of a 1% overall registration gap (a la 2008) or 4% gap (a la 2010), we face a probable 6% registration gap. Factor in the GOP advantage in turnout by party. For Colorado, it was an additional 1% in 2008 and an additional 7% in 2010. Somewhere in between and we can't win Colorado. The wild card is the results of the 600,000 multi-state registration mailing coordinated by PEW and Gessler. (That's down from the original 900,000 estimate.) That may help, despite lower interest. Volunteers linger below '08. We do best in liberal, upscale areas (no recession for them) but are far behind in blue collar segments. In blue collar Adams County, we have not hit our stride. Tea Party chatter helps the GOP in Adams, and many voters link county corruption to Democrats. Despite strong Obama support, Hispanics won't have 12% of turnout, our goal. Colorado youth will be tougher to recruit and turn out. Some small counties with college outposts, like Gunnison, likely won't perform at '08 levels. The bright spot is Boulder, but we don't have Northern Colorado in the tank as we did in '08. (13,000 saw Obama this week; four years ago, it was 45,000.) Larimer GOP isn't handicapped by its leader using party funds for personal problems. I ghosted this memo for Jen Cheyne, the Obama campaign's institutional memory in Colorado. Keating is a Colorado Democratic pollster with ties to Udall, Hickenlooper and Hancock. 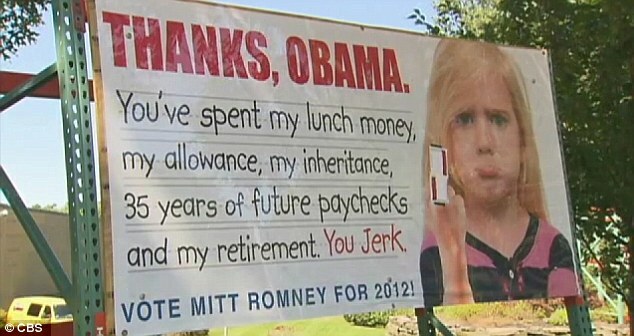 Controversial anti-Obama billboards showing children giving the finger to President Barack Obama have sparked outrage among passing drivers. The three provocative campaign posters are on display outside a motorbike accessories store off Route 27 in Hanson, Massachusetts. ‘Save some for Mitt!’ Clint Eastwood sends Republican convention wild with comedy routine at Obama’s expense… but will it backfire? Eric Folsom, a father from a neighboring town, told local newspaper The Enterprise that it could put him in a difficult position when he passes by with his six-year-old daughter. ‘I don’t know how anybody can approve of that,’ said Mr Brown, a 28-year-old teacher. However, others found the boards amusing, honking or stopping to take pictures as they passed. The offending finger has now been covered over with packing tape and the authorities are debating whether the boards are even legal, since owner Robert Sullivan did not get a permit from the building commissioner to put them up. Town official Bob Curran said the eye-catching signs could be distracting and dangerous for pedestrians and drivers. Mr Sullivan’s lawyer, however, said he is protected under the First Amendment and that he is entitled to ‘free speech’. 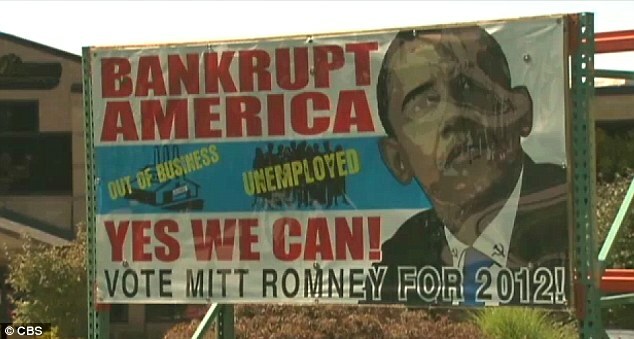 The signs are just the latest anti-Obama displays to cause outrage. 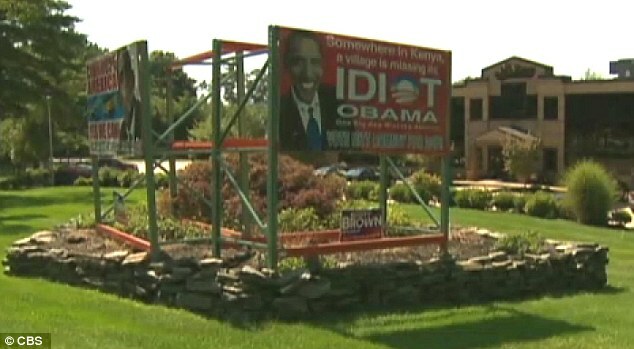 Earlier this month, a protest was staged beneath an Indiana Tea Party billboard that compared Barack Obama to Osama bin Laden. Four years ago on the CSU campus, 45,000 Obama fans gathered in the Oval. I'd say unaffiliated voters were enthusiastic about an Obama visit here four years ago. Today, they were complaining about the traffic jams he caused by coming back. Four years ago, Democrats seemed genuinely and uncharacteristically optimistic, hopeful and energized by Obama. At the same time, Republicans seemed just ordinary Republicans going through the motions of being loyal to their candidate. Today the Democrats appear to be just ordinary Democrats going through the motions of being loyal to their candidate, while Republicans seem genuinely and uncharacteristically optimistic, hopeful and energized about replacing Obama. It’s tough to watch late night TV these days. David Letterman is just a bitter, angry old man. Jimmy Kimmel will take advantage of the “Late Show” host’s decline once ABC moves “Nightline” out of his way, but that doesn’t happen until January; and Jay Leno has now officially gone of the rails. Leno had Dennis Miller on “The Tonight Show” last night and, as expected, Miller was rock solid with jokes. Meanwhile, Leno couldn’t get out of his own leftist way. “At this point Biden’s so silly they ought to put one of those plastic dog collars around his neck so he doesn’t hurt himself,” joked Miller. All “Jay the Joke Killer” could add was, “I like Joe.” Ya, whaddya like him for, he gives you punch lines? Leno, save the punch lines for one of your mechanics—we’d like to have a VP that is actually competent and doesn’t sound like he spent the last six years sparring Rampage Jackson without headgear. Leno was serious about that. Let’s just vote for the spirit of Mother Teresa, and we’ll have everything we need there. We would have compassion taken care of, women taken care of, and Chicago’s dearly departed could come out of the graves again and have a candidate they could relate to. Miller’s retort to Leno’s “War” charge? War on women? With Sandra Fluke? She’s 30, for God’s sake. She’s still in school. She wants me to kick in ten bucks a month for her birth control? Here, I’ll give you ten. Just shut up for a second, okay? [Cheers and applause] This woman, Jay, the war on women, for God’s sake. Oh, it gets better still. Jay, stick to car jokes. Your politics are about as funny as four missing lug nuts on your Duesenberg SG. Big cheers for that line. 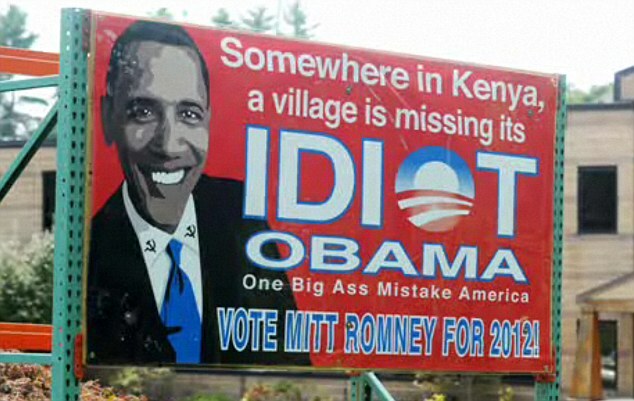 I don’t want to be mean here, but Leno can now be numbered amongst the politically clueless. Please, somebody give Miller a late night TV gig.